Season the salmon with salt and pepper to taste. In a pan, heat butter, chopped shallots, and garlic over medium heat. Sauté until the shallots become translucent. Bring the heat to high and add the white wine. Let the liquid cook out for about 5 minute, then add the cream cheese and sauté for 1 minute. Lastly, add the spinach, bread crumbs, and Parmesan cheese. Sauté just until the the spinach softens. Unfold the puff pastry onto a light floured surface and roll out the 2 sheets, then cut them in half. So you end up with 4 pieces. I made each piece about 10X 14 inches. 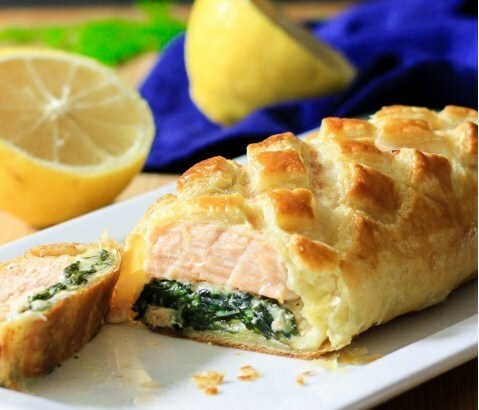 Place each seasoned salmon fillet in the middle of each puff pastry sheet. Depending on the size of the fillet, you may need to roll out the puff pastry a little more or less. Leave about 2 inches around the edges. Divide the spinach mixture into 4 equal parts and evenly spread it on top of the 4 fillets. Then brush the edges of the puff pastry with egg wash (1 egg + 1 tsp water). Begin folding the the puff pastry over starting with the longer side. When folding over the short edges, brush more of the egg wash before folding. Line a baking sheet with parchment paper and place the salmon wellington seam side down. Make crosshatch slits on top of the Wellington with a knife. Then brush with more egg wash.
Bake at 390 degrees Fahrenheit for 25-30 minutes or until the pastry is golden brown.